Hey there and GOOD morning! I hope you have a WONDERFUL day today! I have a busy one...first thing, BOOTCAMP...then more sticks to pick up, next work...then dog training (the trainer forgot to come on Monday) and then to work again! It's gonna be a CRAZY morning! I had a WONDERFUL class yesterday! A couple of friends rode with me down the mountain with me and joined me for the class! I am amazed how fast the drive goes by when riding with friends...chatting and sharing stories! My friends are such a blessing to me!! I CHERISH our time together!! 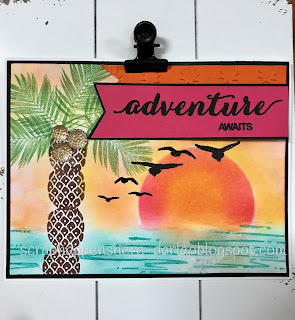 We made some great cards at my class and I will be sharing more of them with you soon, but today I wanted to share some cards that I created using the technique I shared on my Tuesday's Tip YouTube video day before yesterday! I hope you'll give it a try! The stamp sets I used for this card are Pop of Paradise (the pineapple for the trunk); Fabulous Flamingo (the fronds and the water) and High Tide (the seagulls). The sentiment is from the Dare to Dream Hostess stamp set. The colors I used were Early Espresso, Garden Green, Bermuda Bay, Basic Black, Pumpkin Pie, Crushed Curry and Melon Mambo. The coconuts are Clear Faceted Gems. After creating the sunset, the palm tree and water on this card, I added real sand with Heat & Stick embossing powder. You can also use Multipurpose glue and heat it with your heat tool. I stamped the girl from Beautiful You with VersaMark and heat embossed it with Black embossing powder. You can also use Memento Black ink. I stamped the girl again onto Color Theory designer paper, cut it out by hand and adhered it to the stamped image on the card. The sentiment is from the Colorful Seasons stamp set! The last card I want to share with you today is made just as the above above. I also included a sailboat that was created using the Swirly Bird stamp set! I am so happy with all three of these cards...they are so beautiful! I truly hope they inspire you to create! Thanks BUNCHES for stopping by again today! Stay safe and cool!